One of my favorite weeknight meals to make these days is mujaderra. Just rice and lentils cooked together and topped with a glistening pile of sautéed onions. It’s easy to see why it’s known as Middle Eastern comfort food. There are so many variations of this recipe, but my favorite involves just five ingredients — rice, lentils, olive oil, salt and onions. Jewish traditions of mujaderra come from Syria and Egypt, where it was often prepared as a Thursday night meal before Shabbat. The recipe dates back as far as the 13th century — some variations are porridge-like, and others (like this recipe) yield a pilaf whose rice and lentils are distinct. I wondered if there would be a way to bring some seasonal produce into this dish without disrupting the beautiful way in which it’s already so complete. I went to the farmer’s market for inspiration, and returned with a few kabocha squash, a Japanese pumpkin variety. They’re as decorative as they are delicious. 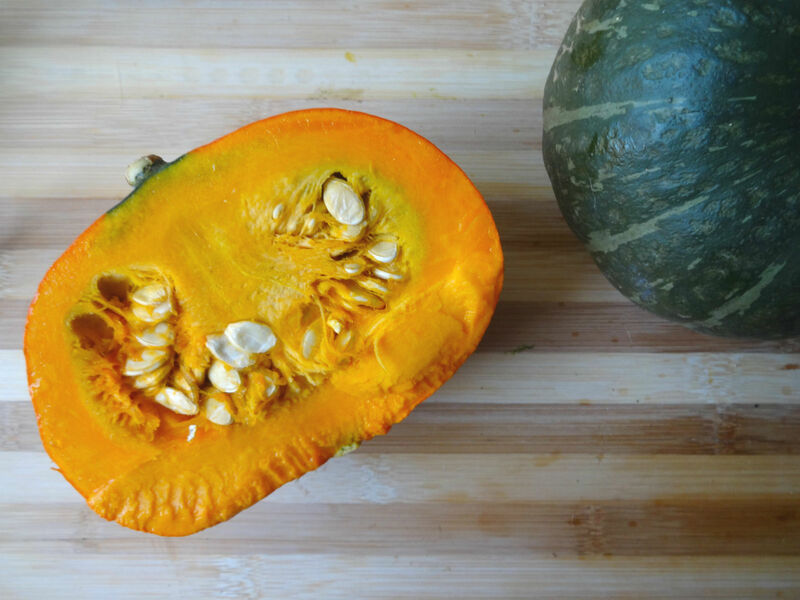 But you could also substitute acorn squash or small sugar pumpkins in place of the kabocha squash. I cut them in half, de-seeded them and roasted them, transforming them into festive, edible vessels for mujaderra. 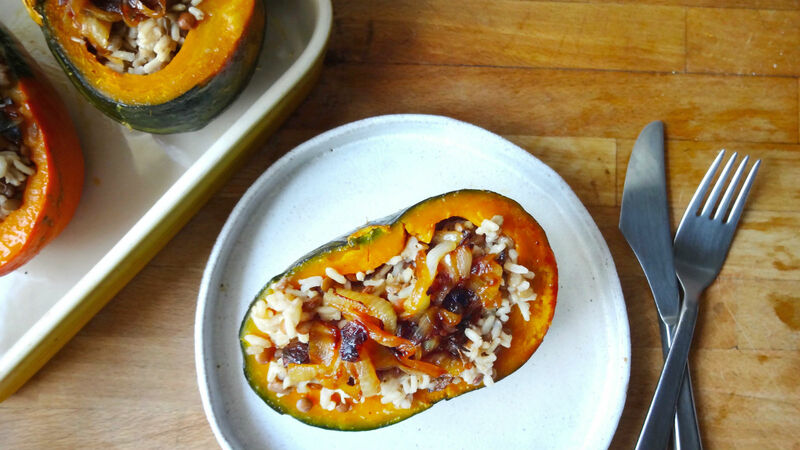 The soft sweetness of winter squash offers a perfect contrast to the earthy brown rice and lentils. This hearty vegetarian meal has it all — a complete protein, vitamin-rich winter squash, plus the sweet treat of fried onions. Take it to the next level by topping with tahini dressing or a spoonful of labne. This dish is vegan, gluten-free and perfect as a weeknight dinner or holiday entree. Watch our video on how to make mujaderra here. Bring water, 2 tablespoons of oil and salt to boil. Then add brown lentils and brown rice. Let this come to a boil and then turn down the heat to low. Cover, and let simmer for 45 minutes or until tender. 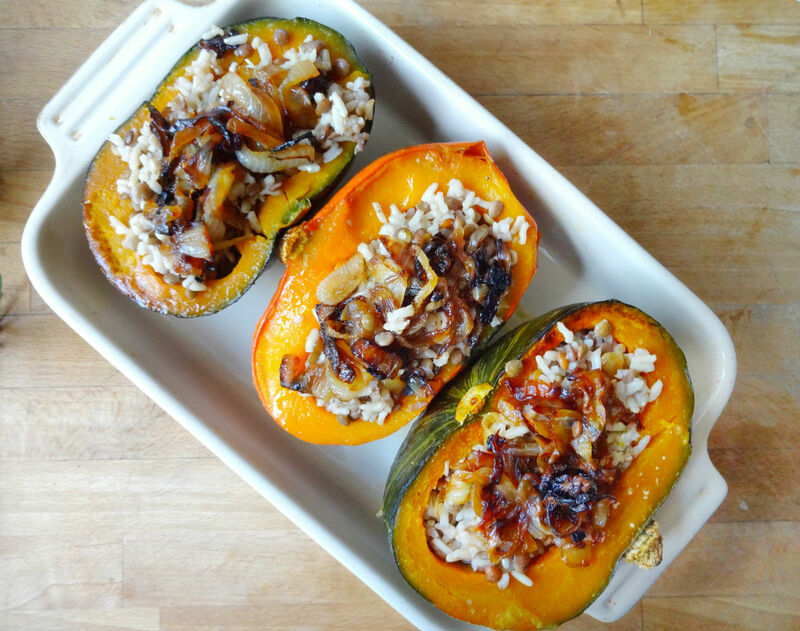 As the rice and lentils simmer, coat the flat side of the squash halves with olive oil and sprinkle the insides with salt. 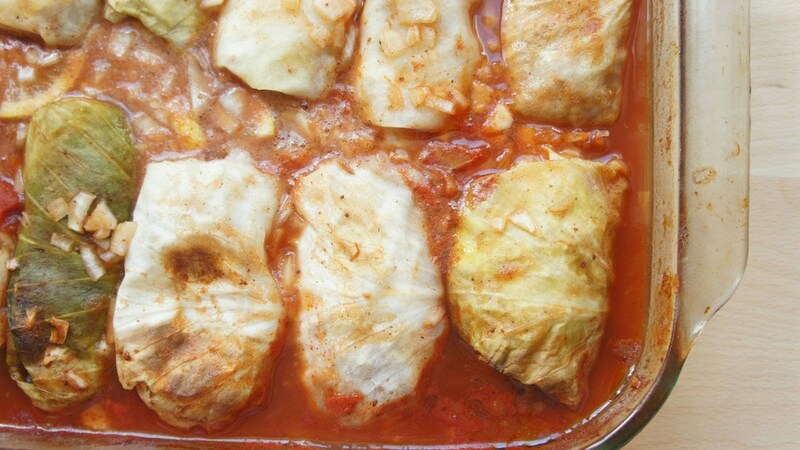 Place flat-side down on baking sheets and roast in the oven for 30-45 minutes or until tender when pierced with a fork. Meanwhile, heat a frying pan or cast iron skillet on medium. Add 1/4 cup oil and the sliced onions, and sauté for 20 minutes or until the onions are soft and browned to your liking. Season with paprika to taste. If you want to garnish the dish with tahini dressing, make this by whisking all ingredients except water together. You’ll notice that the dressing will become very thick. At this point, add water 1 Tablespoon at a time until you’ve reached your desired consistency. When the squash and mujaderra are both done cooking, scoop each half of the squash with mujaderra, top with onions, and serve. Garnish with fresh herbs, tahini dressing, labne or Greek yogurt.